First stage- weed and dig over existing beds. Not straying too far, just sorting out what is already there ready for planting. Build compost bin from pallets. Next stage- second bed at the front of the plot. Lots of weeds but some has been covered in polythene so should be ok. Want to have this done by the end of February, incorporating the leaf mould I already have at home. Next- kids' plot- clear of weeds, prepare areas to plant some of Jake's tomatoes and some pumpkins. Kids can then sow flowers around pumpkins for a nice looking plot- try to choose companion flowers for the rest of the crops. Clear area between kids' plot and blackberries for tomatoes. 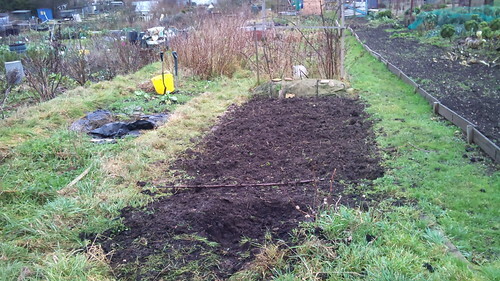 Next- clear area between compost heap and raspberries for sweet corn this will become the soft fruit area next year. By this time all the existing beds should be clear. First bed- last 1/4 Not sure yet. Likely to be some potatoes but it hasn't been maured. Could also do some climbing beans put it's at the SE corner of the plot so they will shade other crops. Second bed- Peas and broad beans, beans to dry. Gap between raspberries and compost- sweetcorn. Tomato seedlings- start some now to raise in the greenhouse, more in late February/early March for outdoors. Also get some beef tomato seeds to grow in greenhouse, raised bed and allotment to see where works best. Chillis for greenhouse patio and raised beds. Remove the raspberry canes, gaining a bed. Finished digging the first bed, first plantings, originally uploaded by mike1727. I cheated by (deeply) forking over the first bit of the bed. That seemed to be ok at fishing out weeds but couch grass appeared like exploding spaghetti in the rest so deep digging was called for. Dig, fish out handful of roots, turn soil, pick out the bits you didn't see first time. Repeat till end of row.Fork bottom of trench.goto 10. One dustbin and two trugs of weeds, carpet amd crap later the top quarter of the bed is done. It's a bit higher than the rest but needs leveling so it will come out roughly flat. I'm concerned that I've left some fragments of couch grass in there. Time will tell, I'll spot weed with fork or roundup later in the year if weeds come up. Not sure about the rest of the bed yet. 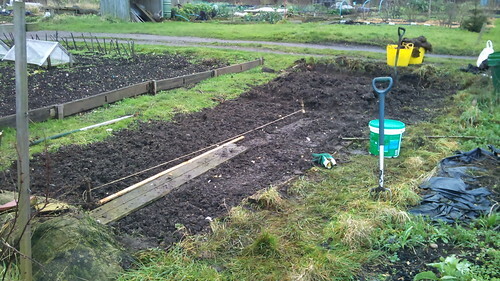 Too square for the amount of broad beans or peas I want to plant. first bed 3/4 done., originally uploaded by mike1727. After two years on the waiting list I finally got am allotment. It's in a bit of a state, beds needs serious weeding and digging because I don't think it has been properly worked for a while. There are two raspberry thickets which need to come out cos they're in the way and pretty crap canes. Apart from that it seems fine, soil ok but a bit stony so will need manure, probably in the autumn now.